NO time limit !! 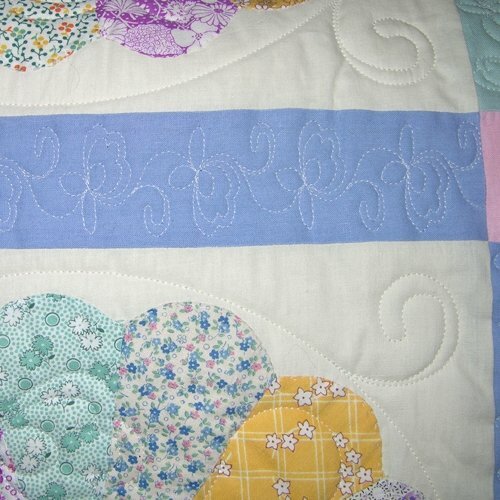 ….PLUS, as many quilts as you want quilted !!! 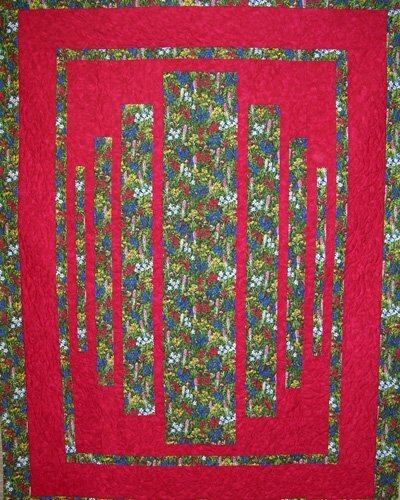 See some of the quilts we’ve done below. 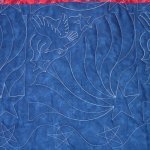 If you’re looking for EXPERIENCED HAND-GUIDED CUSTOM MACHINE QUILTING (since 1978) or SPECIALIZED STATLER STITCHED QUILTING , we provide a professional service at a very reasonable price. 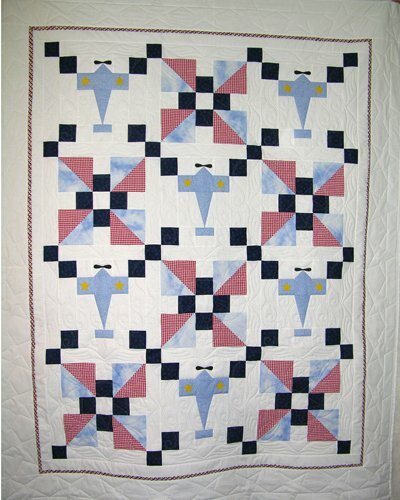 Repetitive patterns are generally quilted over the entire quilt top; however, the borders can be quilted with a different pattern if you choose. 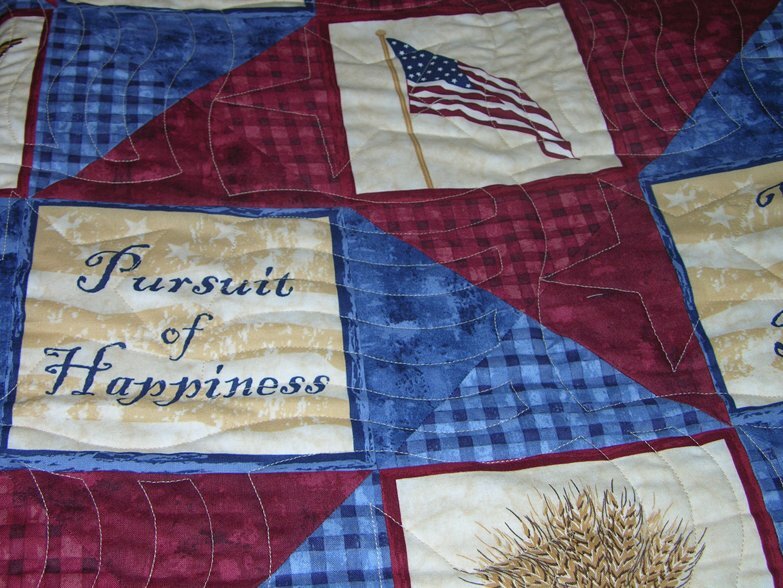 Our goal is to complete your quilt according to your wishes. 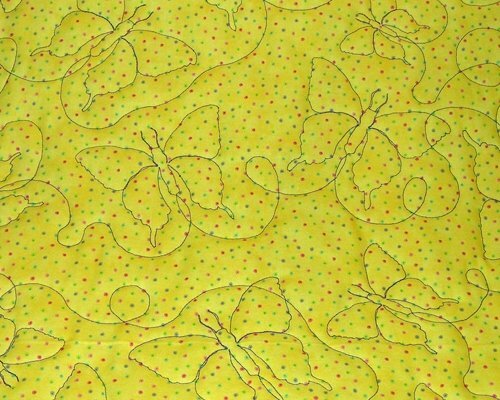 At your request, we can provide machine stitched binding so your quilt is ready to use immediately. We’ll be glad to discuss design wishes, batting choices, and prices to create your one of a kind heirloom treasure. 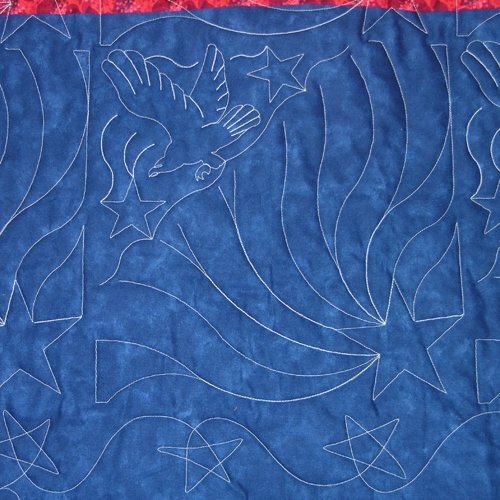 Our custom quilting service includes outline quilting, stippling, block by block quilting to name a few choices. Other styles are available including fabulous feathers of all sizes and styles. 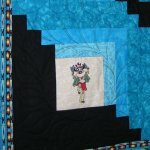 Border quilting can be a different design used only on the borders, feathered scrolls, leaves, or any other pattern you like can be used. I don't reserve space on my machine quilting schedule. You don't get a spot until the quilt is actually brought into the shop and left in my hands. I will try to accommodate deadlines but need at least 4 to 6 (four to six) weeks lead time, depending n the time of the year (Christmas and graduation seasons). 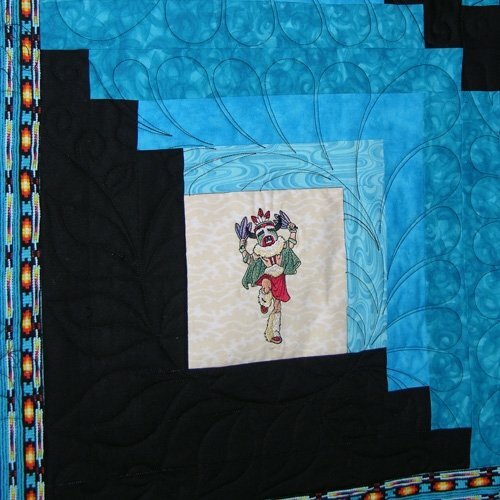 Quilts that you want to present for Christmas need to be in my hands by November 1st. 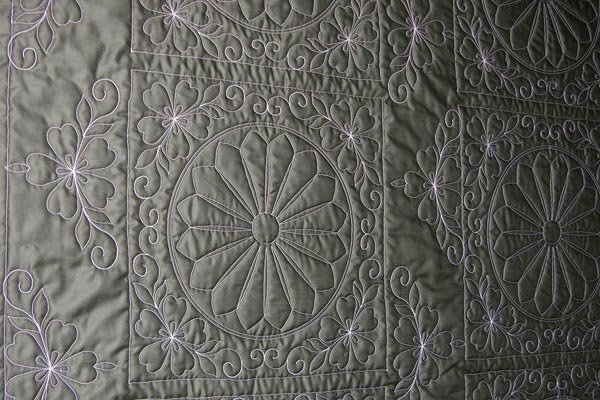 A rush fee of $50 will be added to all machine quilting for those that cannot wait until their turn comes up on the list. Specialized Statler Stitched Quilting is computerized allowing us to provide you with the best possible quilting available with precision stitching throughout your quilt. 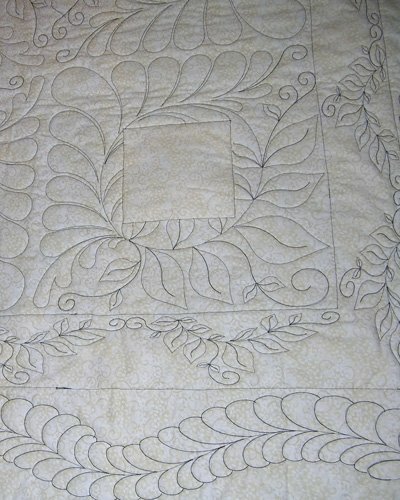 Hand guided quilting is not computerized, it is hand guided, resulting in some variance in repetitive patterns. 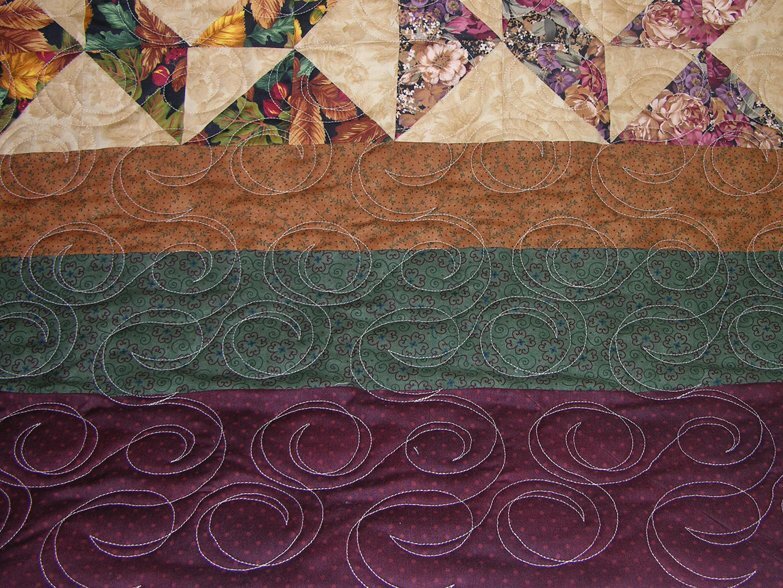 Every effort is made to clip and trim threads, but occasionally we’ll miss one, so please check your quilt. Occasionally I have inquires about MINKEE, DOUBLE KNIT TOPS, AND RECYCLED BLUE JEAN TOPS. I know these fabrics will out last me, but unfortunately, they have been an extremely expensive disaster on my quilting machine; therefore, we are no longer able to quilt them. 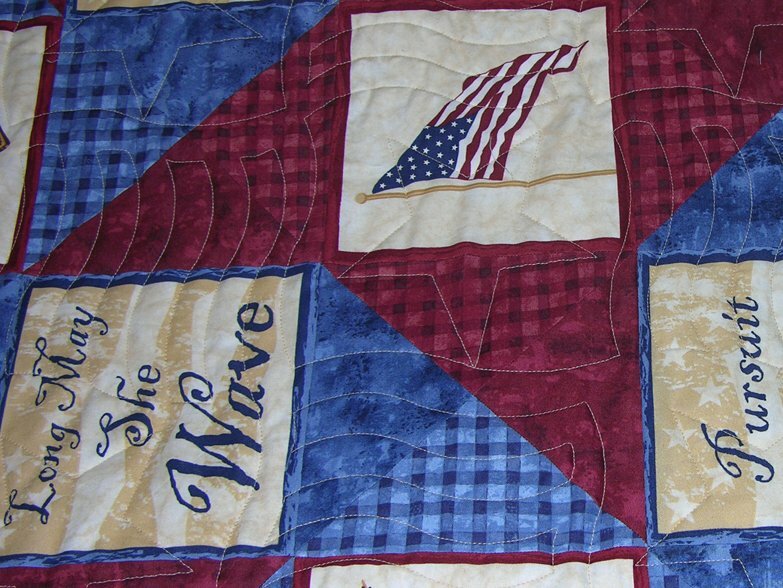 Your quilt is important to us and we take pride in the quality of our work! 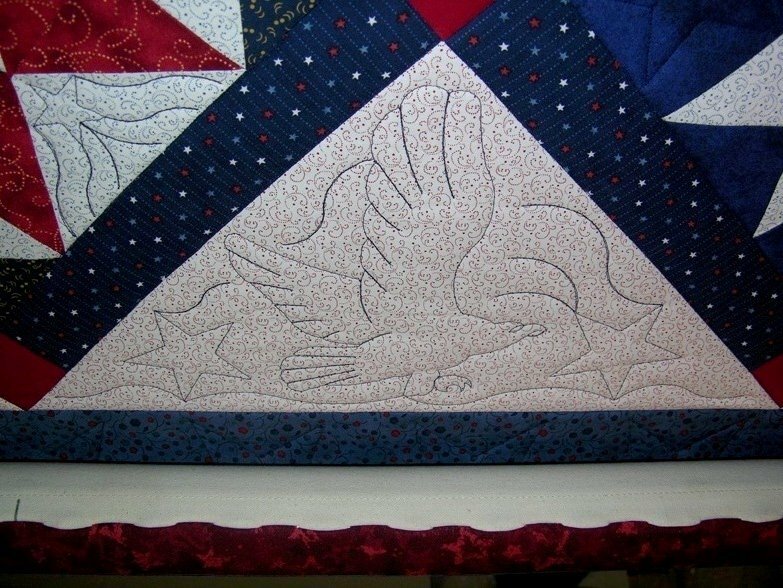 We can assure you that throughout the process of quilting and finishing your treasured quilt top, we will dedicate our time and effort to make it a beautiful quilt that you will be proud to display in your home or give as a gift or family heirloom. Rest assured that your quilt will be handled with tender loving care in a smoke-free environment. We have many, many quilt patterns on hand. We can custom design borders and block insets. We study the current styles and periodically attend training classes to update our skills. To keep updated with the popular trends in quilting, we also subscribe to several periodical publications. 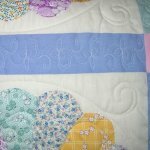 In order for us to be able to load your quilt onto the frame your backing MUST be 6″ (six inches) wider AND 6″ (six inches) longer than your quilt top. For instance: if your quilt top measures 80 x 96 your backing must be 86 x 102 — if it is not, at an additional cost to you, we will sew a strip of fabric onto your backing to give us the ability to load and quilt your quilt properly. The six inches is an absolute MUST! 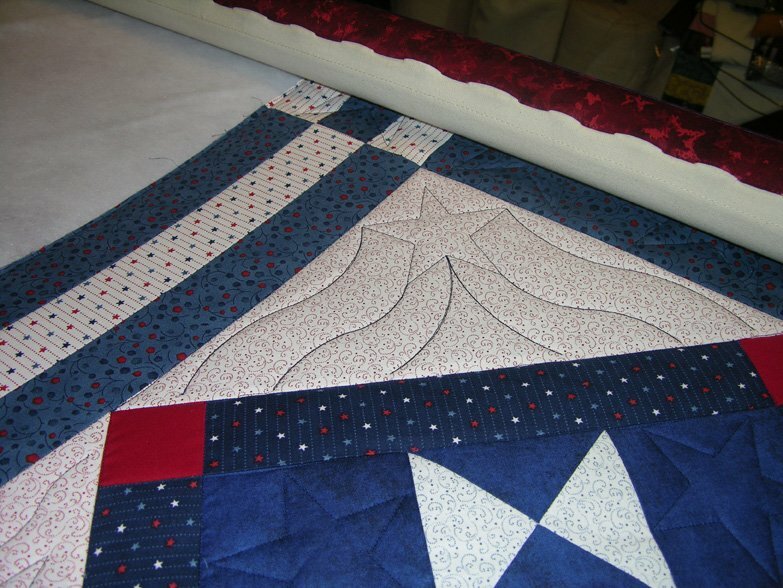 All of the binding is completely machine stitched when we bind your quilt (at your request only). 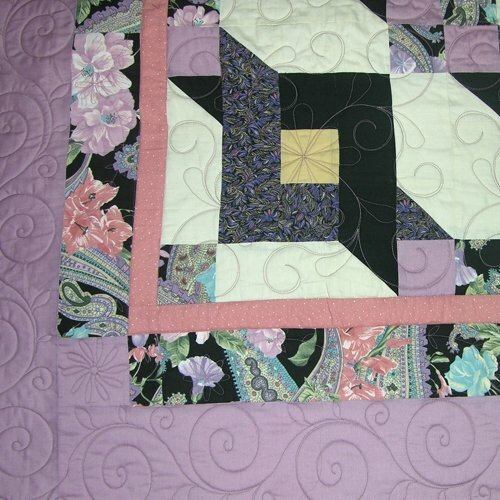 We make a double binding and then sew the binding to the front of the quilt. We then fold the binding over to the back and finish stitching from the back. 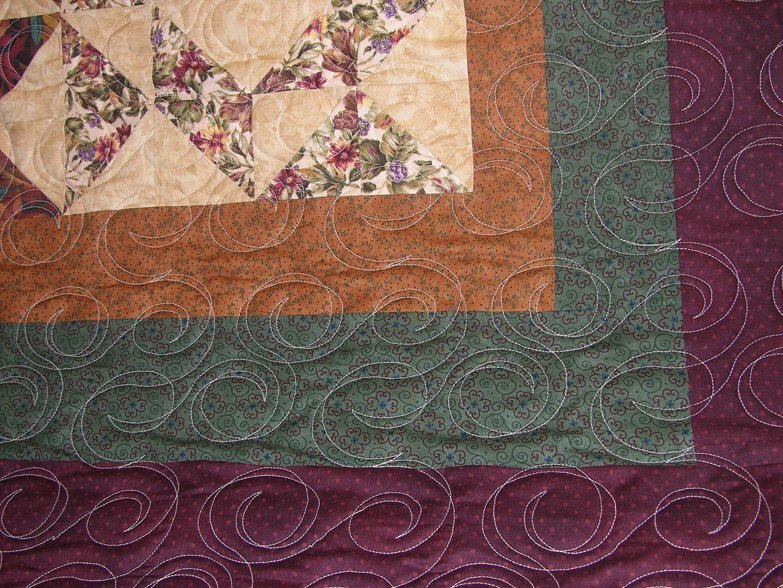 The binding can also be sewn on the front of the quilt for you to hand-finish. 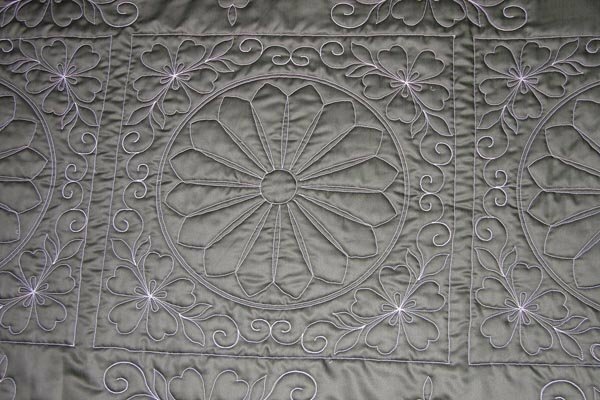 We can use white or natural thread on your quilt. 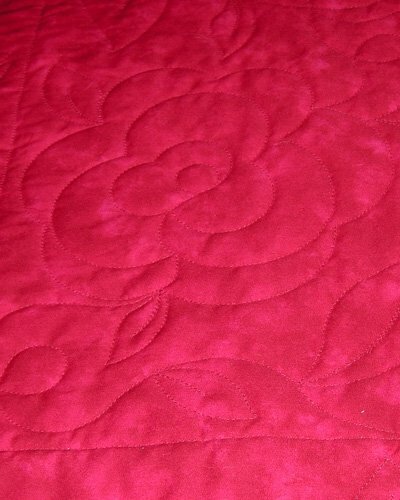 We also have a large selection of colors and can try to match the color of your quilt. If we have to special order your thread, we will contact you and there will be an additional charge. Minimum charge for thread will be $5.00 per quilt; however, if your quilt requires more than 3 bobbins the thread charge will be calculated at a rate of $ 1.50 per double bobbin. Prices are figured by the square inch (length X width X price per square inch). Please add $ 50.00. 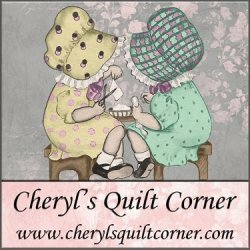 If you find yourself in a rush to have your quilt back much sooner we’ll do our best to rush it through and get it out as soon as possible; however, there will be a rush order charge added if you cannot wait as your name comes up on the list. 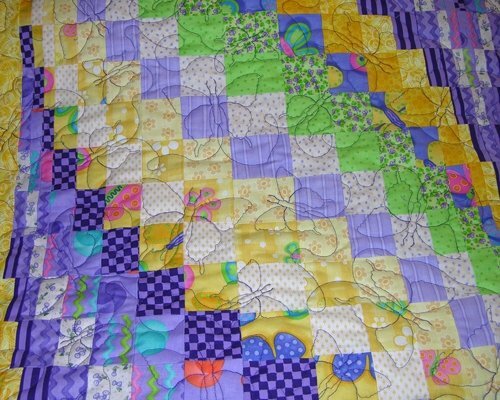 Prices listed do not include sales tax or shipping charges if your quilt needs to be mailed. We ship via USPS, insured, with delivery confirmation. AT YOUR REQUEST, prior to work, an ESTIMATE will be provided for the total job. We’ll try to get some finished quilts photographed and loaded — this will take us a little time and will change quite frequently, so check back often.